To most of us, the mother-of-pearl found in the shells of mollusks is just a decorative leftover. But material scientists see something else when they look at it. Mother-of-pearl (more formally known as nacre) is an organic-inorganic composite material with excellent mechanical properties that are hard to replicate in artificially produced composites. This inspired researchers from Rice University to develop a better way to judge the usefulness of composite materials before they’re ever produced. There are a multitude of considerations that go into the design of a new composite material. Different use cases require a different mixture of toughness, strength, and stiffness. While these terms are often used interchangeably in casual conversation, to material scientists they have very different and specific meanings. For example, the strength of a material indicates how well it holds up to being stretched or compressed. Stiffness describes a material’s ability to resist deformation. 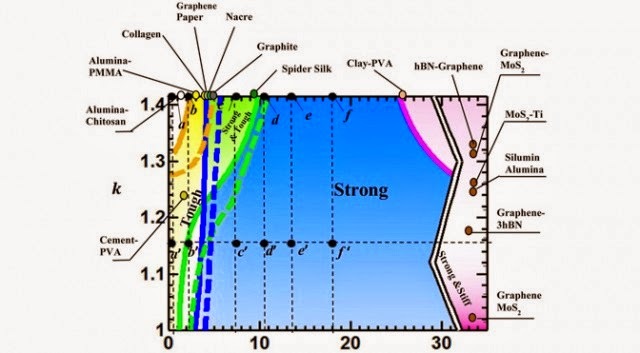 As for toughness, that is a measure of how much energy a material can absorb before failing. It’s tricky to judge the performance of a new man-made composite in each of these categories before you make it, but the Rice University team used nacre as a starting point to do just that. Rice researchers Rouzbeh Shahsavari and Navid Sakhavand studied the structure of nacre under the microscope. 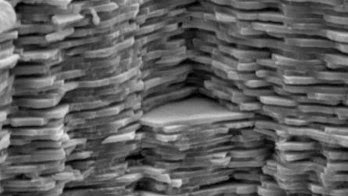 Nacre is known as a platelet-matrix composite, which means it’s composed of overlapping disk-like structures held together with natural polymers. It’s like a brick wall on the microscopic scale with high strength and toughness. Designing similar platelet-matrix materials in the lab has proven difficult, because there hasn’t been any good way to evaluate the relationship between structure and materials. The design map created by Shahsavari and Sakhavand provides the necessary guide. If you need something with high stiffness and strength, for example, you can plug the design variables into equations and see where it falls on the map. It took three years of intensive calculations to create this map, which accurately predicts the mechanical properties of a variety of composites. How do they know the theory is accurate? Shahsavari and Sakhavand evaluated a number of synthetic and natural materials to see if the real-world performance matched the theoretical predictions made by the map. They found a very close match between theory and practice. The Rice University design map could become a useful tool in many manufacturing industries. Any time engineers need a material that has specific properties, they could test a variety of designs virtually without actually going to the trouble of making them. The design map basically guides material scientists to the right composite without all the trial and error.